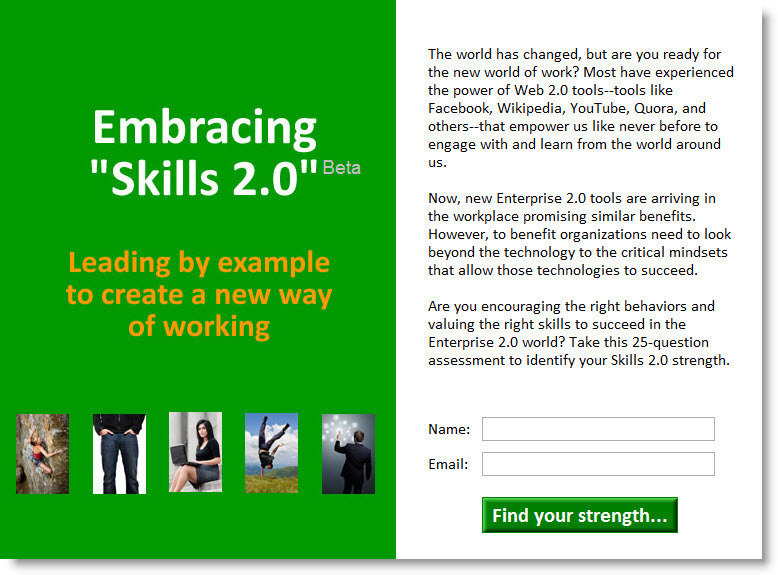 Are you encouraging the right behaviors and valuing the right skills to succeed in an Enterprise 2.0 world? Most have experienced the power of "Web 2.0" tools -- tools like Facebook, Wikipedia, YouTube, Quora and others -- that empower us like never before to engage with and learn from the world around us. Now, new "Enterprise 2.0" tools are arriving in the workplace promising similar benefits. However, to benefit, organizations need to look beyond the technology to the critical mindsets that allow those technologies to succeed. The world has changed. By empowering people and tapping into the power of “we”, the web has changed the way we live and is increasingly changing the way we work. New business models are emerging that challenge the ways they have always worked -- models that force us to reconsider the skills required to succeed. And, while most organizations recognize this, many may be hanging on to dated models for how they manage their people, beginning with the basic skills and behaviors that they request from and reward in their employees. It is important that organizations take time out to evaluate the skills they value in their employees. Without this re-evaluation, organizations risk being locked into older, slower, business models that will hamper their ability to innovate and compete with organizations that have adopted Enterprise 2.0 technologies and a Skills 2.0 mindset. To realize the real benefits of these new business models, organizations need to go beyond asking for change or implementing new technologies, they need to identify and reward skills & behaviors that are aligned with the organization of the future. Each individual will complete an assessment that addresses five critical areas of The Skills 2.0 Model. The results of the assessment will identify a skill for each individual in which they already demonstrate some level of strength. Each individual will identify a short-term, measurable action or set of actions that further builds upon this existing skill and demonstrates value to the organization. Participants will have the opportunity to help refine individual action plans to ensure they are targeted at organizational benefit as well as individual growth/development. At the mid-point of the action plan execution period, teams will regroup to discuss progress and help other participants make any needed adjustments in their action plans. At the conclusion of the action plan execution period, the team will evaluate and select individuals whose actions added the most value to the organization. The team will collectively document and publish the results of the experiment for the benefit of the rest of the organization. Success in the Enterprise 2.0 world relies on skills that have not been traditionally emphasized or valued in the workplace. By encouraging employees to actively model Skills 2.0 behaviors, we will gradually create a culture where these behaviors are standard practice. The goal of this experiment is to raise awareness and create an environment where it is okay to think and work differently. Thus, even if people do not complete (or even create!) their action plans, the exercise is a success if conversations occur where people acknowledge that, to lead in an Enterprise 2.0 world, we need to revisit the skills and behaviors that we value within the organization. 1) Members of the volunteer group should complete the associated Skills 2.0 assessment to identify where they can be Skills 2.0 Leaders & Evangelists. 2) Team completes the sprint plan outlined below. Sprint 1 (1 week): Each individual completes assessment on own. Sprint 2 (1 week): Each individual develops an action plan then shares with team to refine. Sprint 3 (3 weeks): Execute on action plan. Either weekly or at end of sprint, discuss progress & adjust personal action plans. Sprint 4 (3 weeks): Execute on action plan, Phase 2. Either weekly or at end of sprint, team meets to discuss progress. At end of sprint, the team meets and votes on the winner/s. Sprint 5 (2 weeks): Document & publish results. Skills 2.0 Model: Assessment Tool – A short-form assessment tool to quickly identify an individual’s possible strengths and put them on a course of action to increase the level of conversation within an organization. The self-assessment is not intended to be a comprehensive evaluation of all skills and behaviors required for Enterprise 2.0 success. Instead, it is intended to be a method for getting the conversation started quickly about which skills should be valued. The assessment will be refined over time based on participant feedback. Skills 2.0 Model: Skills & Behaviors – A set of recommended skills & behaviors that organizations may wish to consider rewarding. Our hope is that this hack and the short-form assessment drive interest to engage in a more thorough examination of the skills that the organization values, and the norms that they are willing to challenge. To that end, the model includes a more detailed version of the skills & behaviors underlying the assessment tool. Resources – Supporting tools and research that might be worth reviewing to evaluate and drive these new behaviors. This project was developed as part of the Management 2.0 Hackathon, a hands-on, collaborative effort focused on generating fresh and practical answers to today's management challenges. The Hackathon is an experiment in large-scale problem solving from the Management Innovation eXchange (MIX) in collaboration with Saba and the Enterprise 2.0 Conference. This hack was conceived by Ben Willis (@BenWillisSF) and was built by Ben, Nyla Reed (@nylareed), and more than 800 other progressive management practitioners and technologists from around the world. Please help us improve by providing input on the assessment, action plan, or any other aspect of the Skills 2.0 model. We are especially interested in hearing about your experiences with putting any action plans from this experiment into practice.